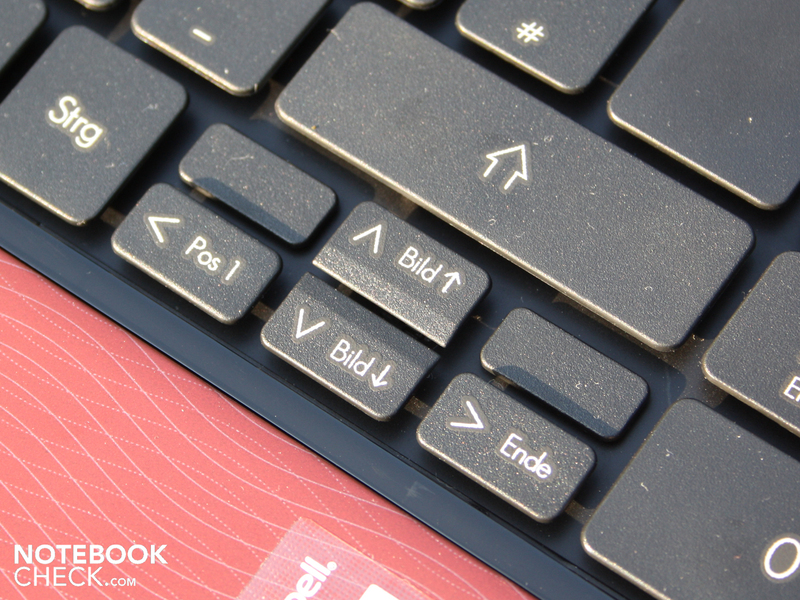 Packard Bell is on a mission. Their notebooks should appeal to color-oriented customers, who feel that design is more important than the technical data. Chromed elements are combined with high-gloss paint and discreet matte surfaces. The product-website claims "a fabulous balance between mobility and functionality wrapped up in a clear, digital-chic style." We aren't exactly sure what digital-chic is, but we can surely comment on the parts about mobility and function. 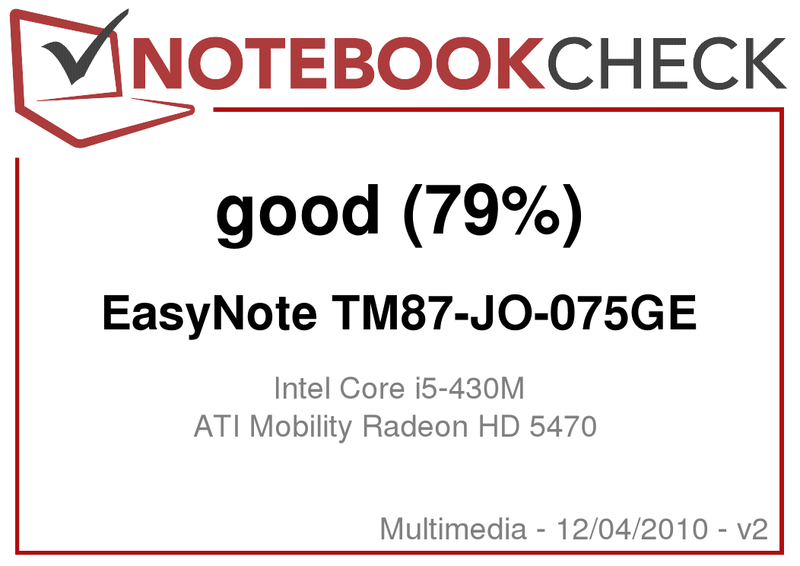 Those who have stumbled upon or taken an interest in the EasyNote TM87-JO-075GE have likely done so because of either its price (starting at 690 Euro) or its optics. 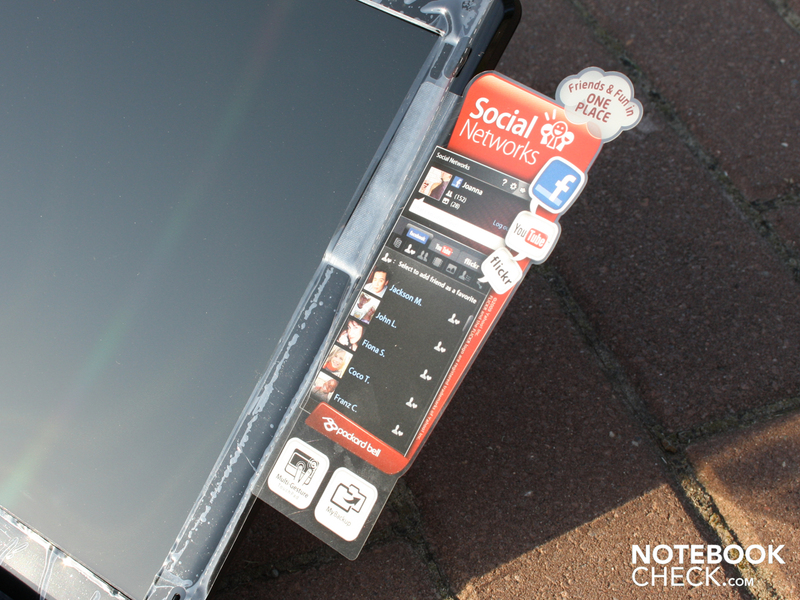 We will find out in this test what the 15.6-inch device has under its pretty little hood, what the significance of the Social Network Button is and if users will be able to get anywhere with the ATI HD5470. 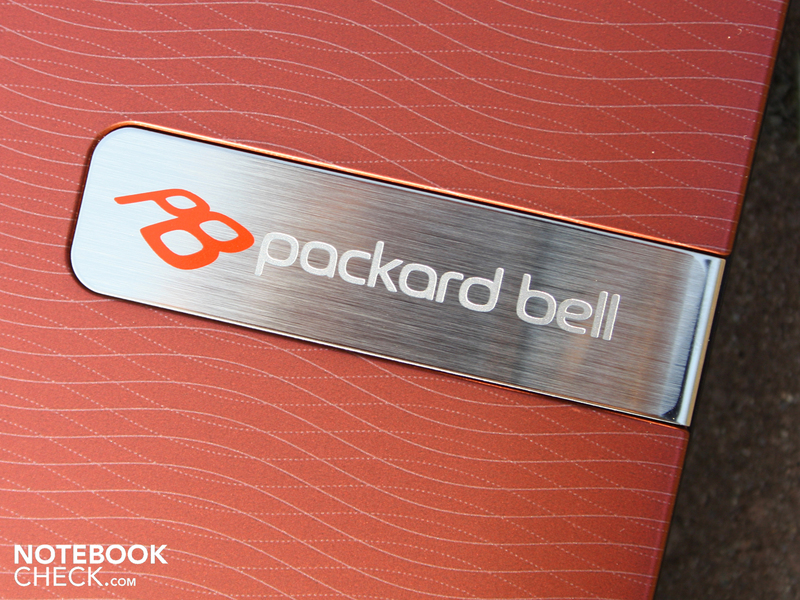 Is the mobility really as excellent as Packard Bell claims it to be? All of these answers and more in our comprehensive review. 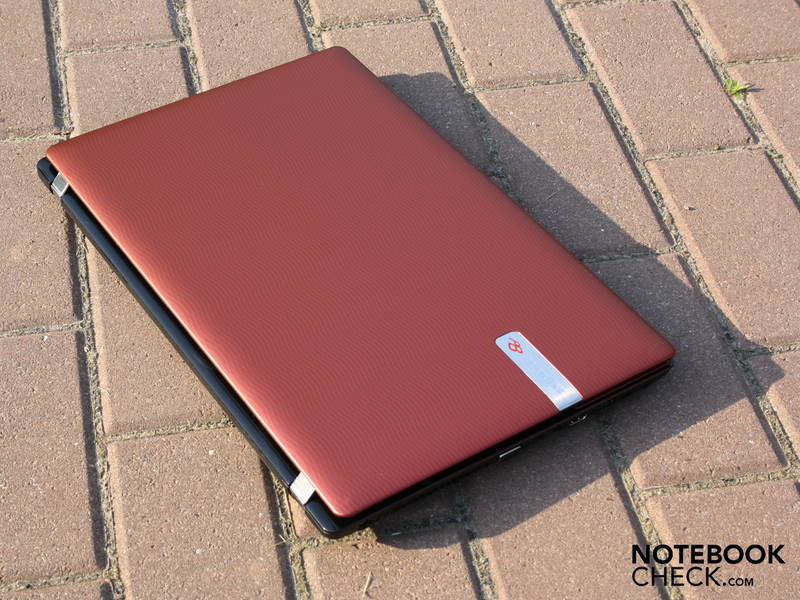 Our test-system has a red cover as well as a red palm rest, though the EasyNote TM can also be had in silver, black or white. The black areas around the work surface are identical to all TM-models regardless of color, the same going for the curved honeycomb design. 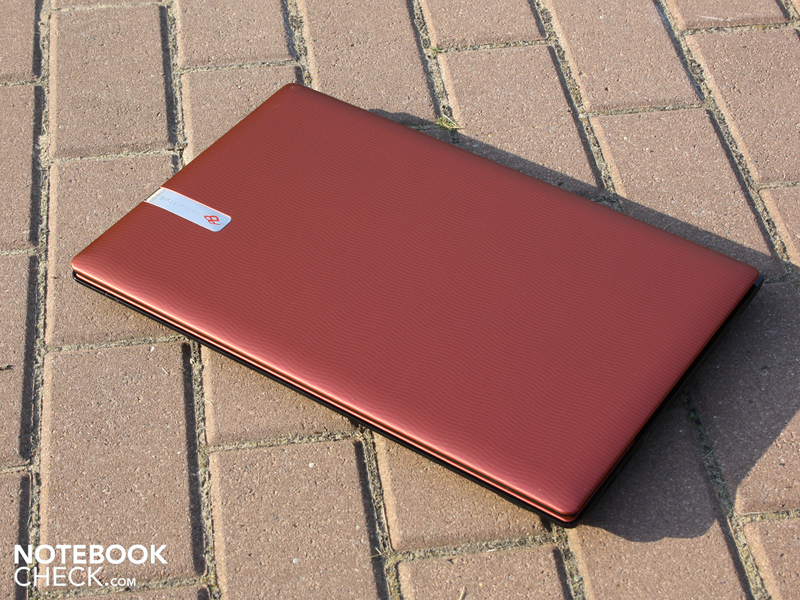 The case is stable and touts a premium look thanks to the matte red surfaces. With both hands we were only able to bend the housing slightly, the palm rest also sitting very firmly in its place. The same cannot be said of the keyboard, as the right side above the optical drive gives way slightly. The display lid could be deformed to a small degree when pressure is applied with the hand, though for its 15.6-inch size it is very sturdy and well within the norm. 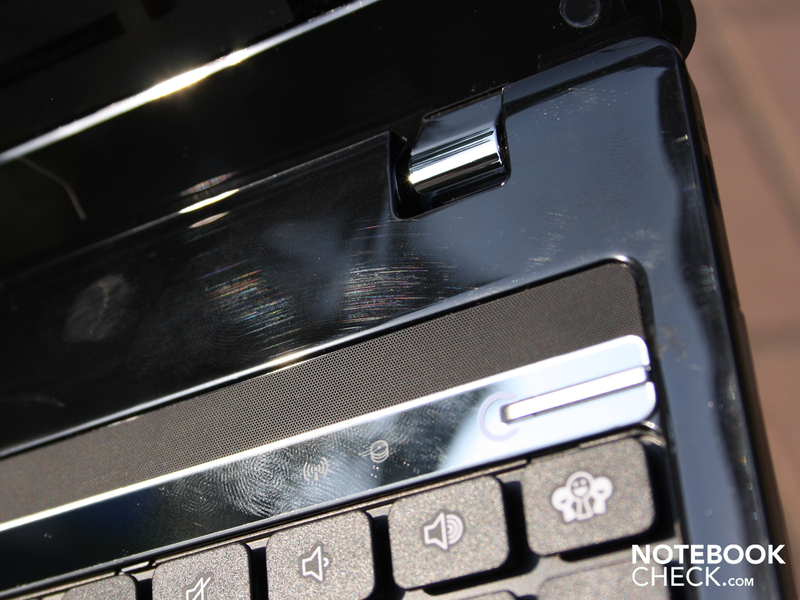 That said, pressure points on the outer lid were quickly visible on the screen when in operation. The outer lid is, at first glance, unaffected by scratches. However, as the material is paint on plastic, one should not go out of their way to beat it up. Fingerprints do not remain on the matte surfaces, unless the fingers are very sweaty. The hinges keep the display firmly in position, allowing the display to move about only slightly. They are very taut and sit in position very firmly, requiring two hands to open the notebook when closed. The maximum angle at which they can be opened is an excellent 160 degrees, which is very close to being able to open the display completely. 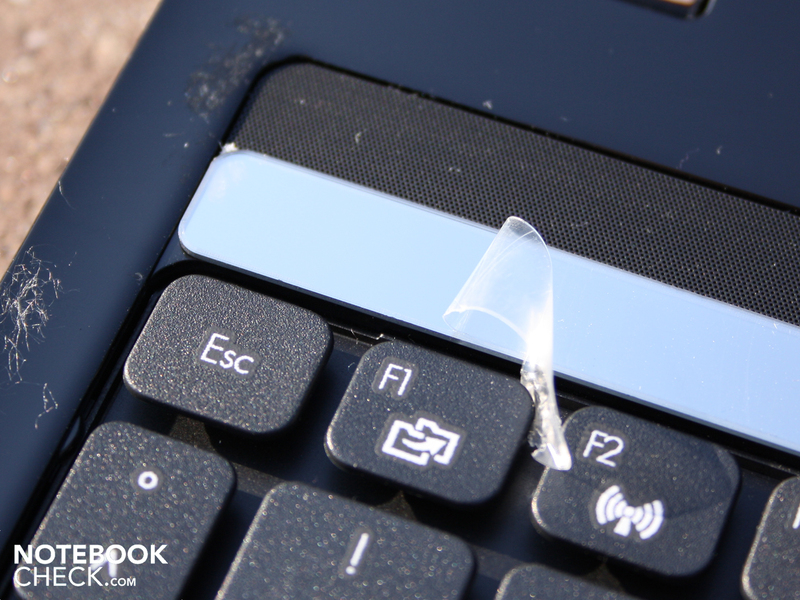 The bottom plate made of thin plastic is easily able to be deformed with a finger. The large opening on the underside is rather vulnerable, which is where we find our expansion options: hard drive, RAM and WLAN-module. 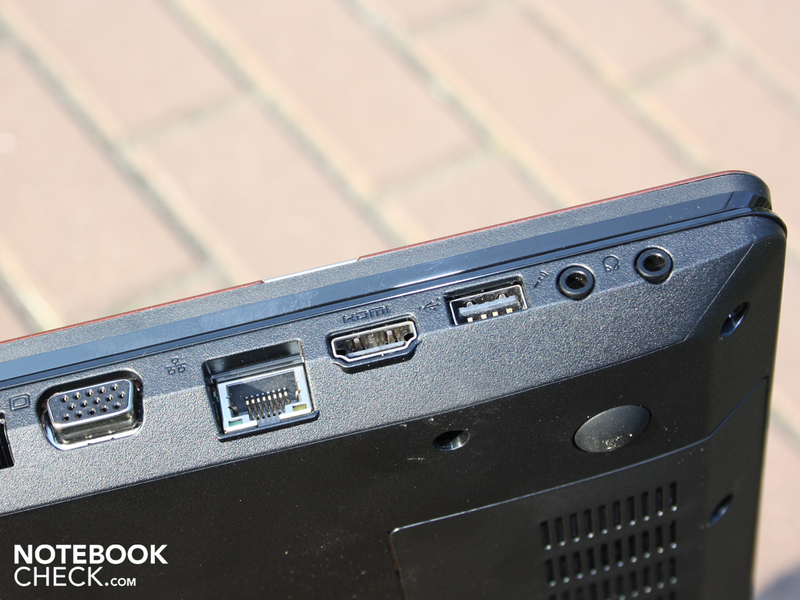 For connecting a printer, router, mouse or external hard drive the Packard Bell Easynote TM brings all necessary ports to the table. Advanced users, who wish to connect a hard drive via eSATA or upgrade equipment via an ExpressCard34 will be disappointed, as these connections are not available on the self-proclaimed multimedia all-rounder. External TFTs can either be connected via HDMI or the analog VGA-interface. There are only three USB-ports, one on the left hand side and two on the right. Their positioning is not particularly sensible. When using a mouse, both right and left handed users will find that they are at a disadvantage. USB-cables as well as HDMI and VGA cables hinder the use of an external mouse, as such, USB-ports on the rear or at least towards the back of the device could have eliminated the cable chaos when working at a desk. There aren't any docking stations available for the Easynote TM, but there are USB-port replicators. What in the world does the Social Network Button above the keyboard mean? Quite simply, it calls up a Social Networking program when pressed. 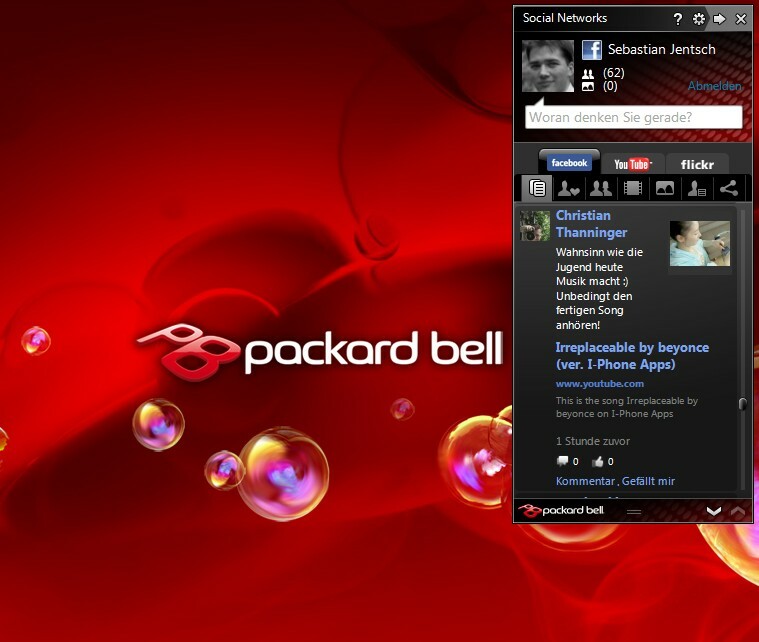 There is a tool called, appropriately enough, "Social Networks" from CyberLink which was developed specifically for Packard Bell. 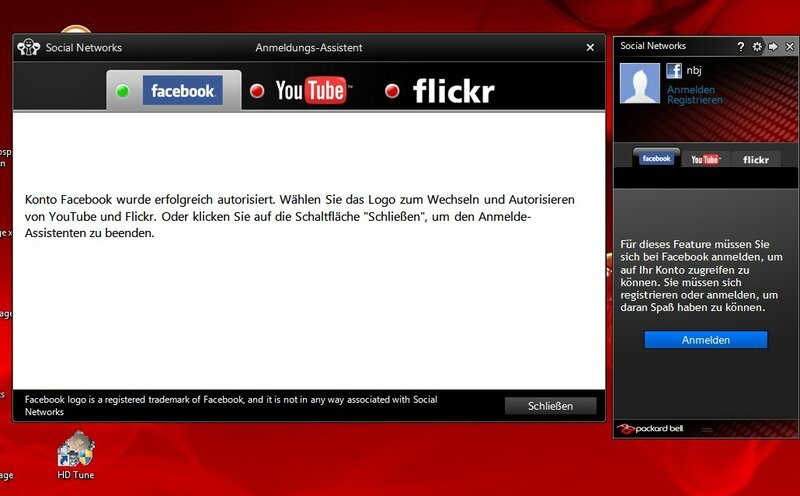 Similar to a Skype-window, we have our Facebook, YouTube and Flickr accounts before us in a mini-format. The advantage: we no longer require multiple browser tabs to be open when a single hardware button will suffice. It is a nice tool that makes networking a bit easier, though it is not yet available as a free download from CyberLink. WLAN is present in the fastest Draft-N standard and supports the Realtek 802.11a/b/g/n wireless card (RTL8191SE), though it does not have a Bluetooth module. For those connecting the 15.6-inch notebook at home via hard wire, the Broadcom NetLink Gigabit Ethernet adapter stands at the ready. The keys offer us a clear pressure point but unfortunately there is a spongy action to the keys. 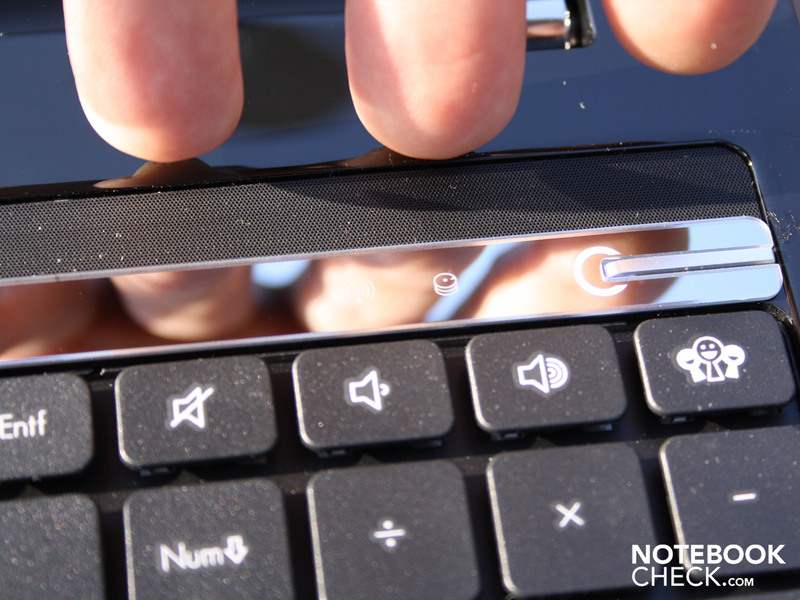 The action is not only spongy when talking about the key itself, but rather the entire surface of the keyboard. That the keyboard rattles would not describe it correctly; on the one hand there is only a dull noise when typing and on the other the pressure point is crisp. Packard Bell integrated a numeric keypad, which is an advantage for office users and makes the input of numbers far easier. Pleasant is that it is a standard-size keypad without keys reduced in sized or left out entirely. More positive news: the arrow keys are about half as big as they would normally be, yet separated from the shift-key by a small space. The surface of the touch pad (Synaptics Multitouch Pad V7.2) is as smooth as the palm rest and works quite well, though for our tastes the surface is a bit too slippery. Optically the pad is at same level as the palm rest and the pattern on the rest of the work surface carries over into the touch pad area while only being haptically distinguished by two raised bumps. The touch-surface has both vertical and horizontal scrollbars. The vertical scrollbar is haptically marked which is a very pleasant feature. 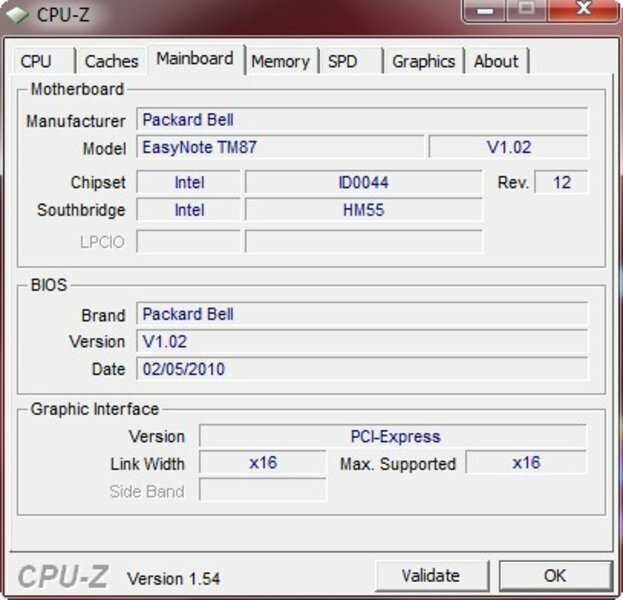 The horizontal movement has to first be enabled in the Synaptics software before use. Those who don't like scroll bars can hop on over to the touch settings. We can scroll both vertically and horizontally with two fingers. Classic movements such as zooming with two fingers are also possible. The mouse buttons click quietly and have a centered pressure point, which gives them a premium feel, as they emit a dull but clean-sounding noise when pressed. 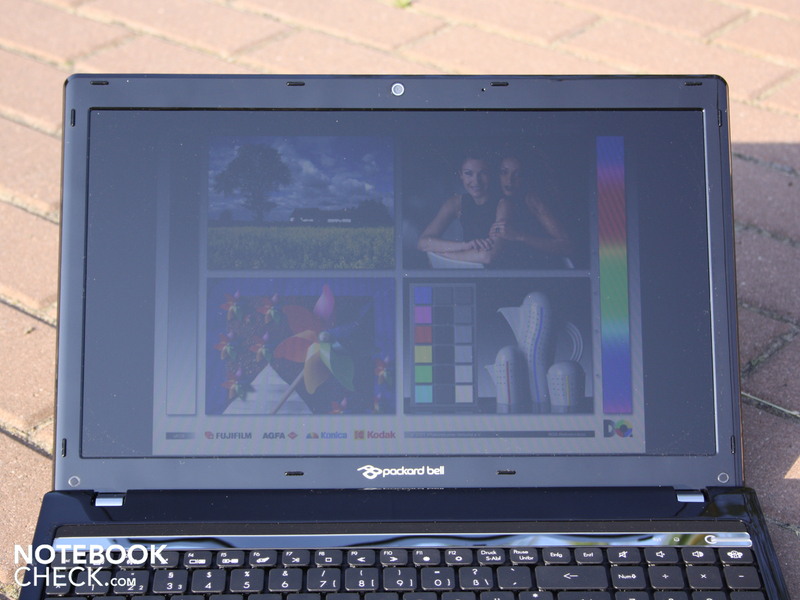 Packard Bell has revamped the optics of the 15.6-inch device to please style-oriented consumers. That said, we should make it clear that the display has been all but forgotten--naturally there is one present, though the glare-type panel (AUO B156XW02 V2) doesn't rank anything above low-budget. The LED-TFT has a native resolution of 1366x768 in a 16:9 format. Most users will be satisfied with this quasi-standard format that they have implemented. Those needing a large amount of display real estate for their desktop will find HD-ready resolution too low. The AUO-panel encounters its first weak spot in its low contrast of 204:1. 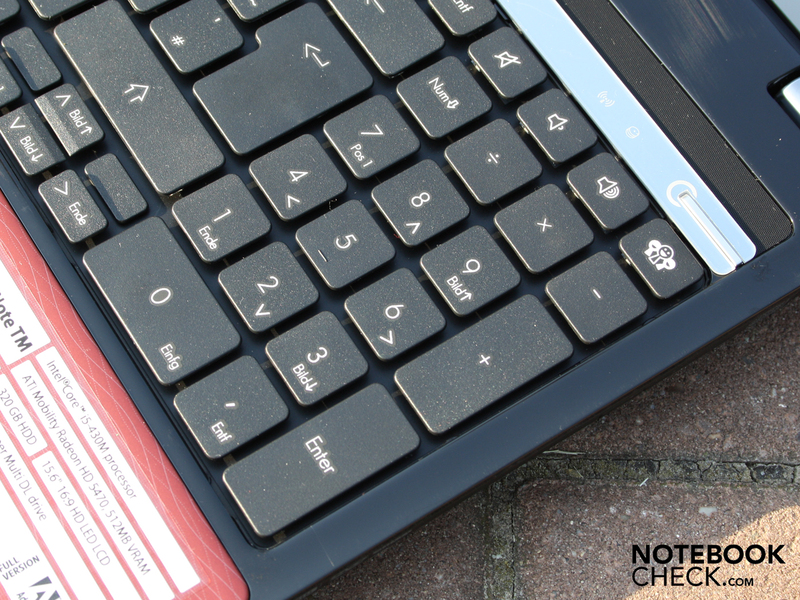 A value of 200 is typical for Office-notebooks and netbooks. 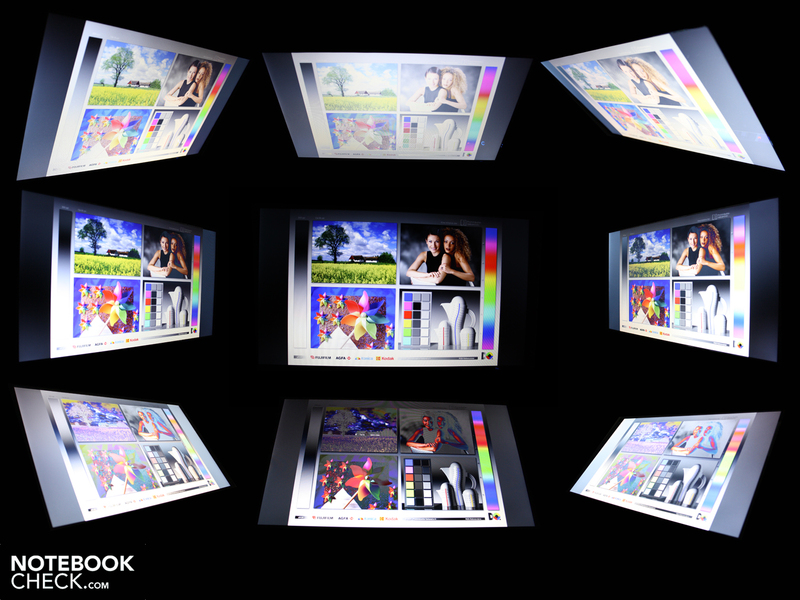 The glare-type panel improves the low-contrast ratio a bit, allowing a more accurate reproduction of colors. To support this, the manufacturer has provided a gaudy desktop background in red. When looking at pictures, watching films or playing computer games the colors are halfway passable. For professionals in the area of graphic illustration or photography the display is extremely unsuitable: the resolution is too low, the viewing angle is too weak and the color space is too limited. Measurements of display brightness yield only disappointing results. On average the luminance is only 197 cd/m². The Gossen Mavo-Monitor peaked at a high of 205 cd/m². The illumination, at 89%, is quite even. When using notebooks in interior rooms users very seldom need a luminance higher than 180 cd/m², though for outdoor use a value like this would be problematic. Those users wishing to use their TM outdoors in daylight or glaring sunlight conditions are going to find themselves encumbered with a viewing problem. 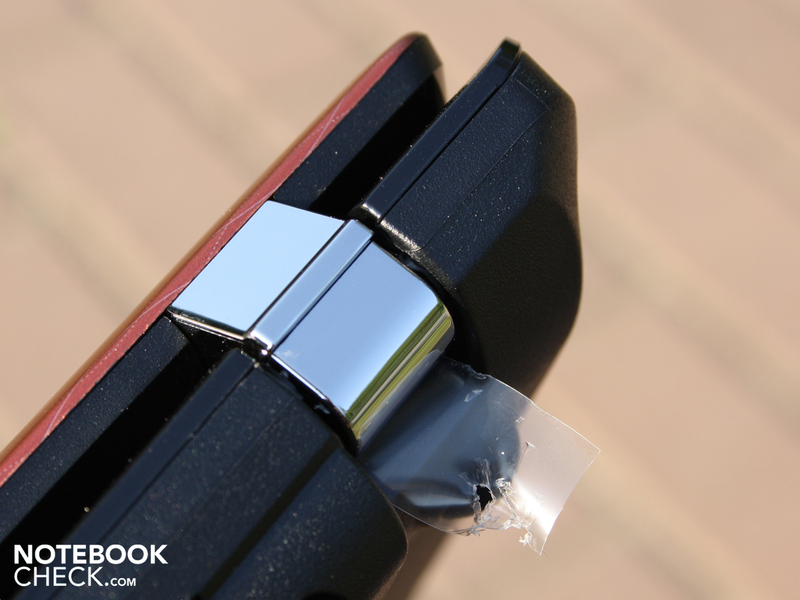 The 15.6-incher does not have a matte finish which would cut down on reflections. For Office-notebooks non-glare panels are best. 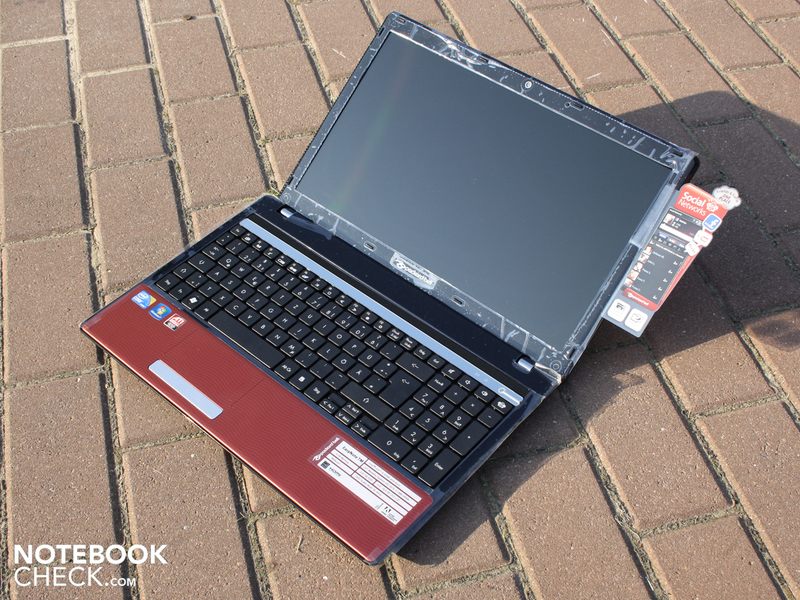 Owing to its use as a multimedia notebook and the improved color, Packard Bell chose to implement a reflective glare-type panel. Under direct sunlight we had great difficulty finding a seating position that was free of problematic reflections. Without direct sunlight we were able to find a halfway passable viewing position, though the low maximum brightness makes what can be seen look faded. Horizontally we were able to deviate 50 degrees from the front viewing position before the display darkened considerably. Vertically the colors falsify much earlier, even as soon as a 10 degree shift is realized. First the picture fades and then the colors invert: in the darkroom photo the color inversion from the vertical is very noticeable. In summary, there are strong limitations when looking at the display laterally from either the top or bottom; when multiple people wish to view a film or look through photos there exists the very real possibility of difficulties. 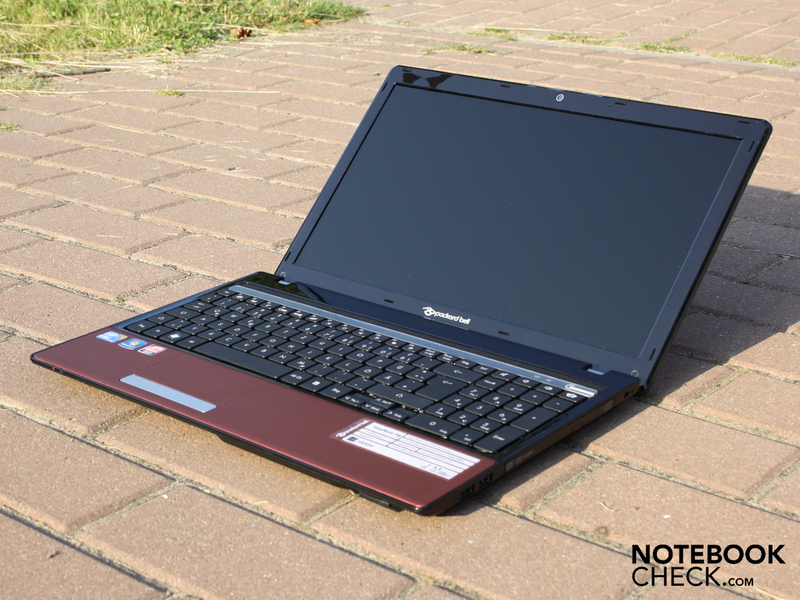 Packard Bell has outfitted the Easynote TM with a Core i5-430M (2 x 2.26 GHz). Though the stock frequency is 2.26 GHz the actual speed whilst in operation dynamically changes up to 2.53 GHz thanks to Intel Turbo-Boost, which automatically overclocks individual processor cores. 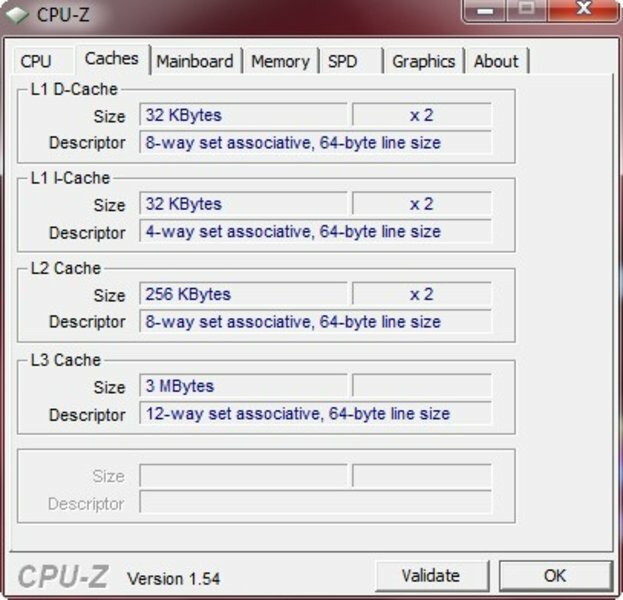 The size of the overclock depends on the system requirements of the applications at hand. In comparison to more expensive Core i5 models like the 520M, the 430M lacks support for Virtualization Technology for Directed I/O (VT-d), Trusted Execution Technology and AES New Instructions. AES, for example, is a CPU feature that helps to en- and decrypt files faster which is important when using a virtual machine like VMware Workstation 7.1. With technologies like these the i5-520M realizes a 70% performance advantage in the PCMark Vantage Communication Suite Test. 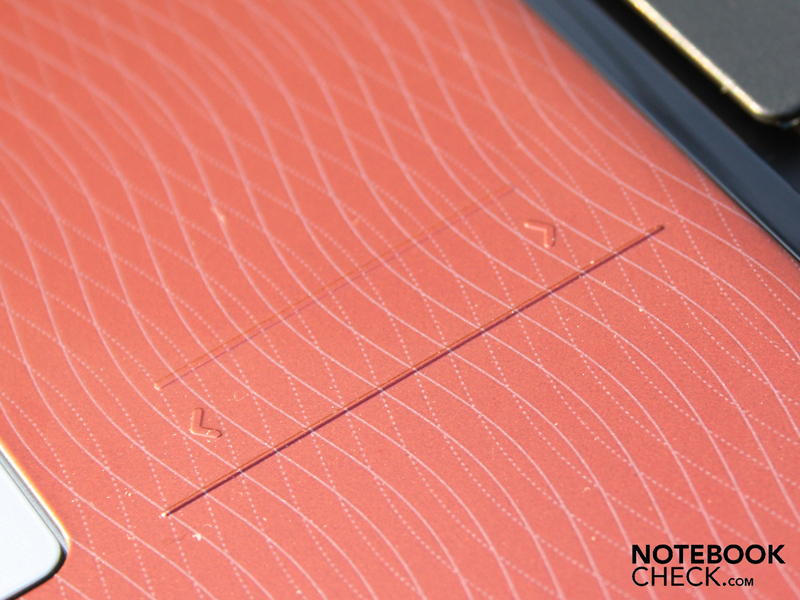 For the Easynote TM's targeted consumer market such details do not play much of a role. Much more important is the Hyper-Threading feature for multi-core applications. Through this technology, the two physical processor cores are supplemented by two additional virtual cores, allowing applications to take advantage of up to 4 simultaneous threads. Furthermore there is 4096 MB DDR3 RAM on board. The energy consumption of the CPU (TDP 35 Watts) is quite high, although the processor itself only requires 25 Watts by itself. The remaining 10 Watts are diverted to the Intel HD Graphics and the integrated memory controller. 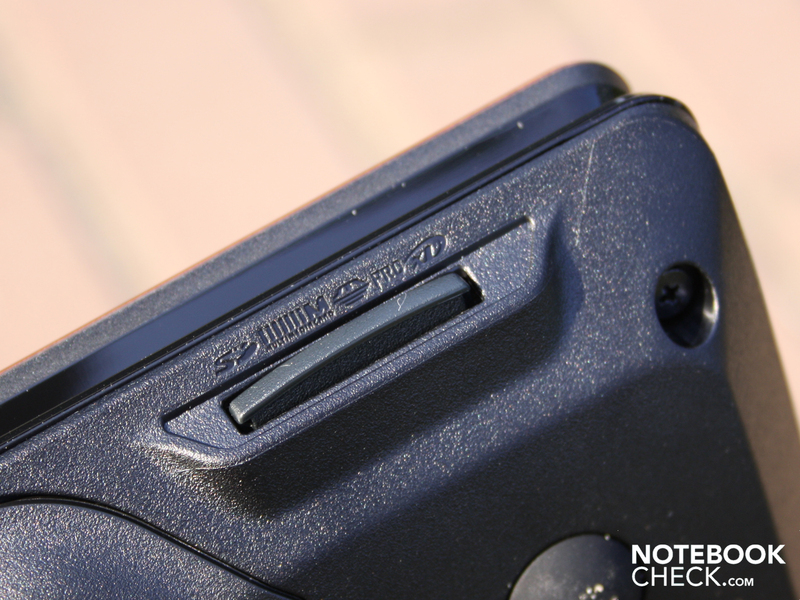 Just how snappy is the Easynote TM when in use? The perceived speed is very quick and it is only when the hard drive is particularly busy that pauses and delays come to light. 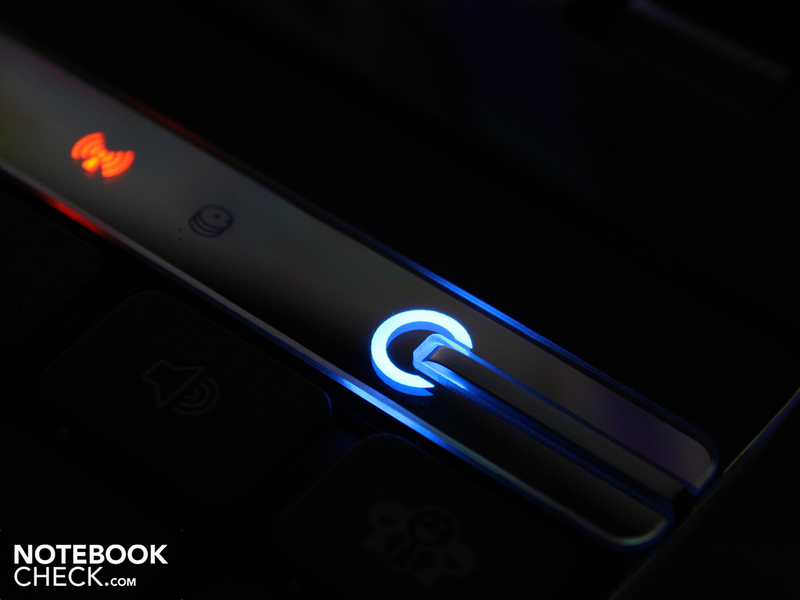 We test the synergy of the CPU, graphics, RAM and hard drive together with PCMark Vantage. The total score of 5,204 points is clearly above those from competing Core i3-330M systems like the Acer Aspire 5741G-334G50Mn (4684 points). 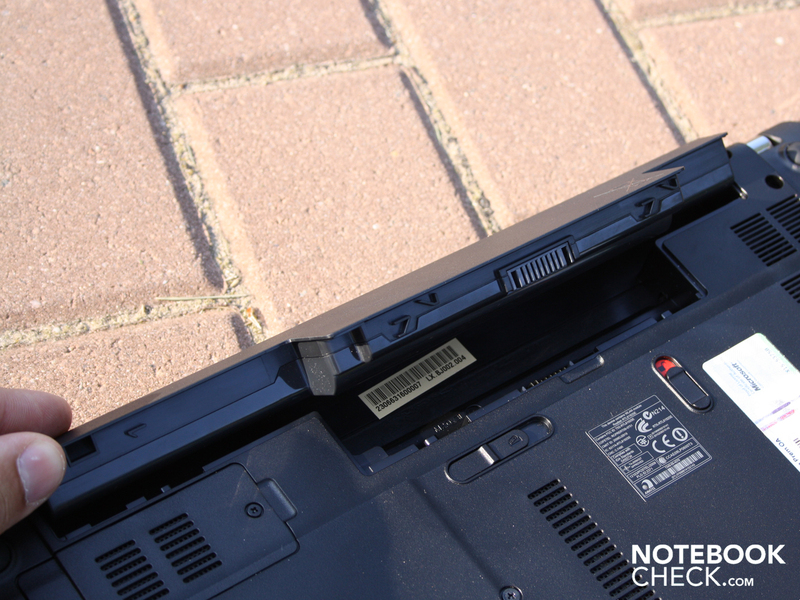 We have compared the Easynote TM to this model because apart from the CPU, HDD and Bluetooth they are identical. On duty here is a Hitachi 5400 RPM hard drive (HTS545032B9A300) with a capacity of 320 GByte and a slow sequential read speed of 55.1 MB/s. This value is under the average sequential read speed for a 2.5-inch notebook hard drive. On the other side of the coin, the burst rate is above the average at 117.5 MB/s. 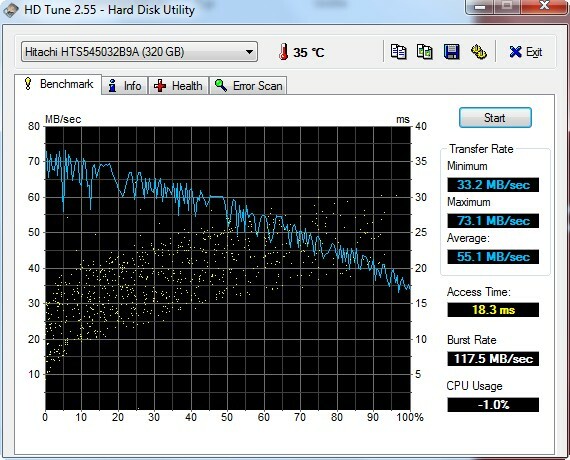 The burst rate tells us the average throughput with which the HDD cache can access the data stored in it. 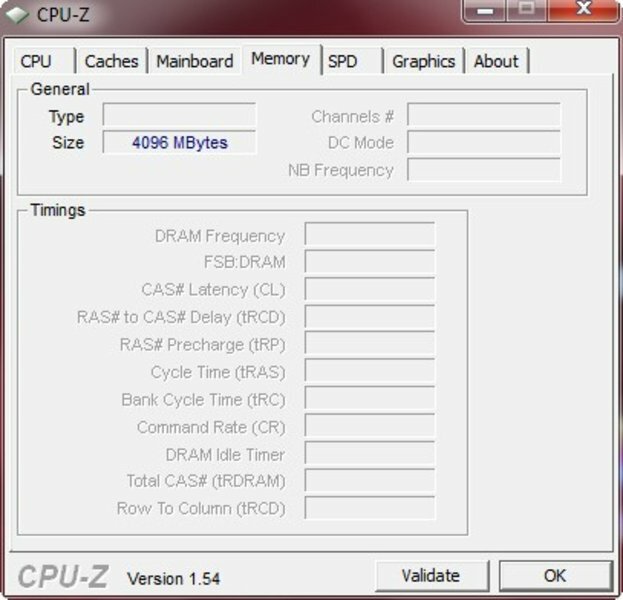 Bad Company 2 doesn't take any prisoners and makes immediately clear how weak the HD5470 is despite its GDDR3-memory. Only 20 FPS on middle settings was possible (1366x768, medium, HBAO off, 1xAA, 1xAF). Even dialing down the settings to 1024x768 (mininum, HBAO off, 1xAA, 1xAF) only brought a small increase to 27 FPS. Regardless, the game always suffered from a choppy frame rate. A Toshiba Satellite L550 with a HD5165 (upper middle-class) was able to put up 44 FPS on middle settings. Infinity Ward's shooter is a bit less demanding. At low details and 800 x 600 (0xAA) a fluid 79 FPS is possible. 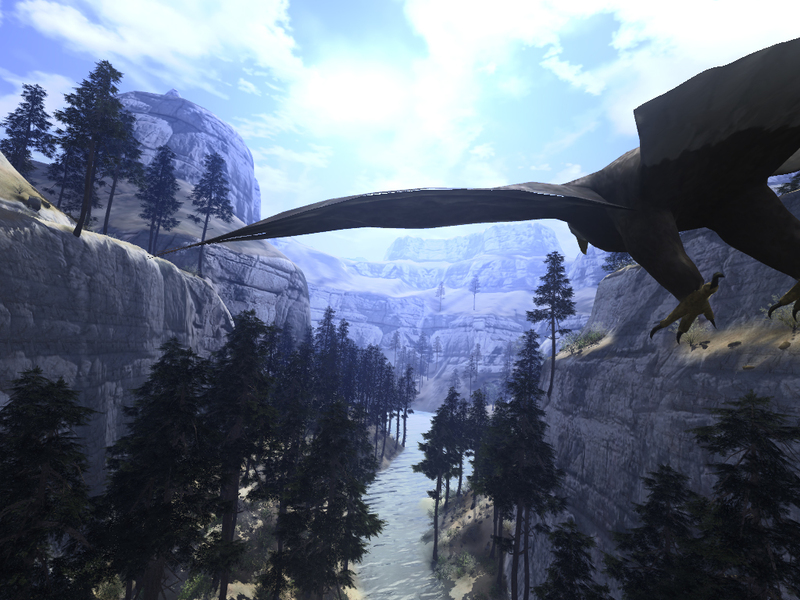 Select middle details (1024x768, 2xAA, medium details) and the frame rate drops considerably down to 26 FPS and the game stutters in action-heavy sequences. At 1024 x 768 and at high details the shooter achieves 47 FPS. The native resolution of 1366 x 768 is playable when a mix of high and middle details are selected. 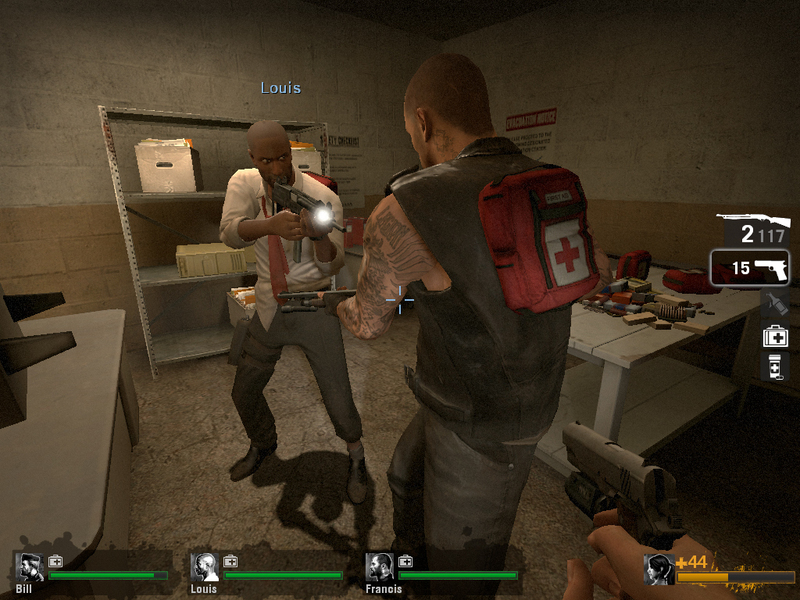 As the gaming tests have proved, the ATI HD5470 doesn't put up strong numbers in any current titles, though older games such as Left4Dead can be played at high details. When it comes to keeping quiet, Packard Bells 15.6-incher is a professional. At normal operation surfing, listening to music or using Office applications the cooling fan turns at low RPMs but never turns off completely. In such a situation we measured 31 dB(A). The hard drive is also role-model quiet and does not raise the noise level at all. During our three gaming-tests the cooling system loudness increased to 35 dB(A). When only the processor is under stress (stress test, all cores at 100 percent) the noise produced is lower at 33.1 dB(A). The highest recorded (yet still non-threatening) noise was 35.8 dB(A) during a Furmark and Prime95 stress test. Here the cooling fan turned constantly. In all the fan control left a positive impression on us; most of the time the fan noise stayed discreetly in the background. The temperatures were not able to keep pace with the excellent results that we obtained previously in the noise segment. During simultaneous stress of the processor and graphics card we measured almost 50 degrees Celsius on the underside near the exhaust vent. Because such temperatures spread out to other surface areas that are cooler, it becomes very uncomfortable to use the notebook on one's lap. The keyboard area during a stress test becomes very warm to the tune of 46 degrees Celsius. 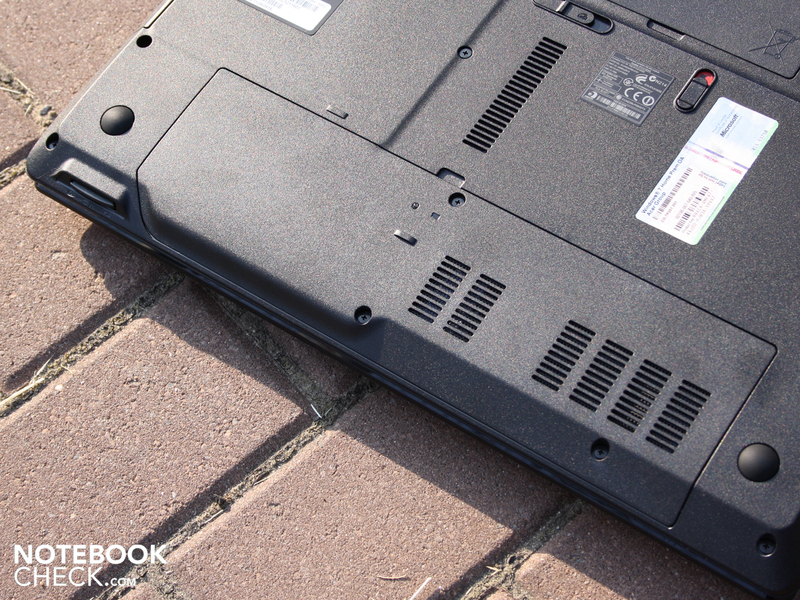 The Aspire 5741G, which shares the same base as the Easynote TM, is not nearly as warm due to its lower-clocked Core i3-330M (no Turbo-Boost). The underside of the 5741G reaches a maximum of 39 degrees Celsius. Results such as this procured from stress tests should not serve as a reference for how the system will behave in normal operation. Those indulging in Social Networks, watching YouTube videos and writing emails should not worry about the kind of temperatures that we saw under stress. Even with demanding computer games the notebook still kept a cool head. 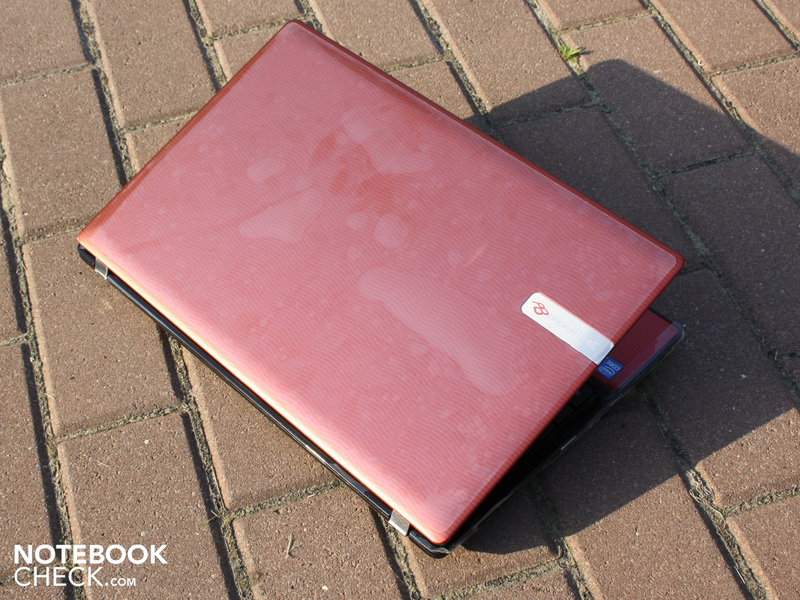 One should expect to see no more than 35 degrees Celsius when operating the notebook under normal circumstances. Though the processor in the stress test warmed up to 91 degrees Celsius (GPU 77 degrees Celsius), we were unable to find any evidence of thermal throttling. A 3DMark06 test executed right afterward confirmed the same number of 3DMarks as a test without the stress factor: 3,732 3Dmarks (CPU 2564). The small deviation can be chalked up to measurement tolerances. (-) The average temperature for the upper side under maximal load is 38.1 °C / 101 F, compared to the average of 30.9 °C / 88 F for the devices in the class Multimedia. (-) The average temperature of the palmrest area of similar devices was 29.1 °C / 84.4 F (-9.9 °C / -17.8 F). The stereo-loudspeakers are located above the chrome-colored strip under a fine mesh. Users with high expectations for the sound will be somewhat disappointed: the sound is very middle-oriented and neglects the bottom end completely. As the system is also missing a subwoofer there is no sound volume or bass. 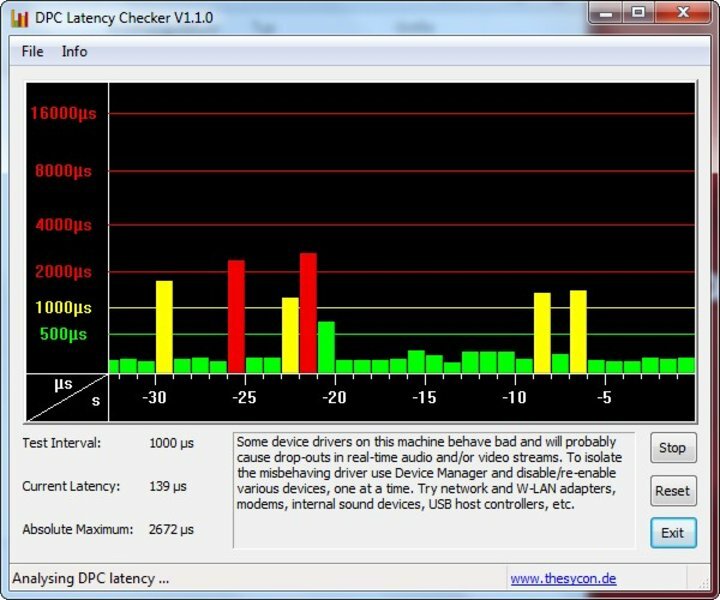 Using the Realtek sound-improvement software helps to balance out the sound to the untrained ear. Finally, the overall volume is sufficient yet not particularly high. External speakers connected via the 3.5mm sound jack are a big help. We tested the line out with two external Yamaha speakers (YST-M20SDP). The signal from the notebook was clean and carried no noise. 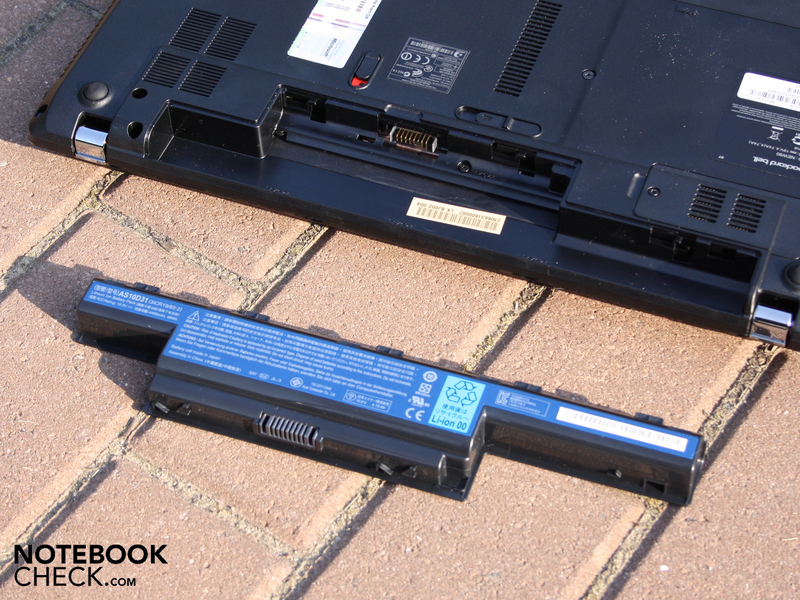 Since netbooks hit the market, the expectations of battery life in standard notebooks have also risen. Battery life should be at least three hours, which the Easynote TM barely reaches when surfing via WLAN. After 2:49 hours (169 minutes) the AC adapter will have to come out of hiding. 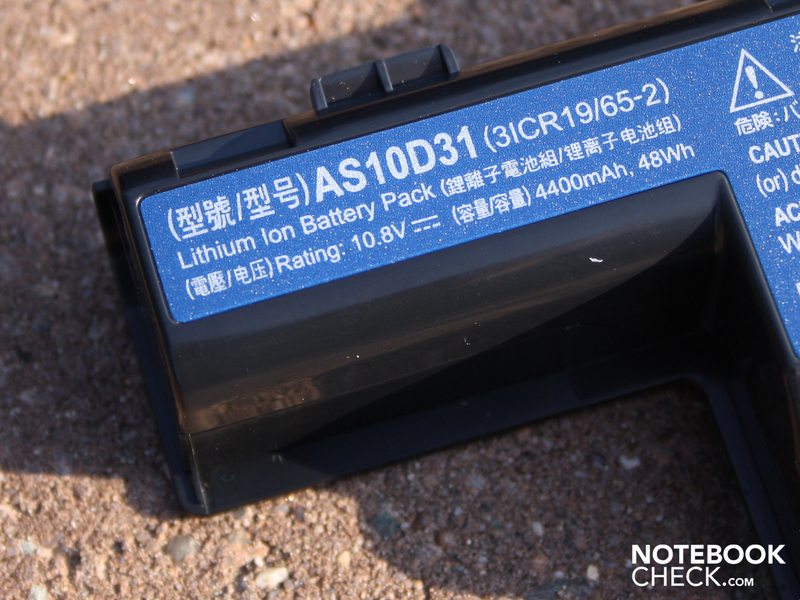 A reason for the relatively low run time is the weak 4400 mAh battery (48 Wh). 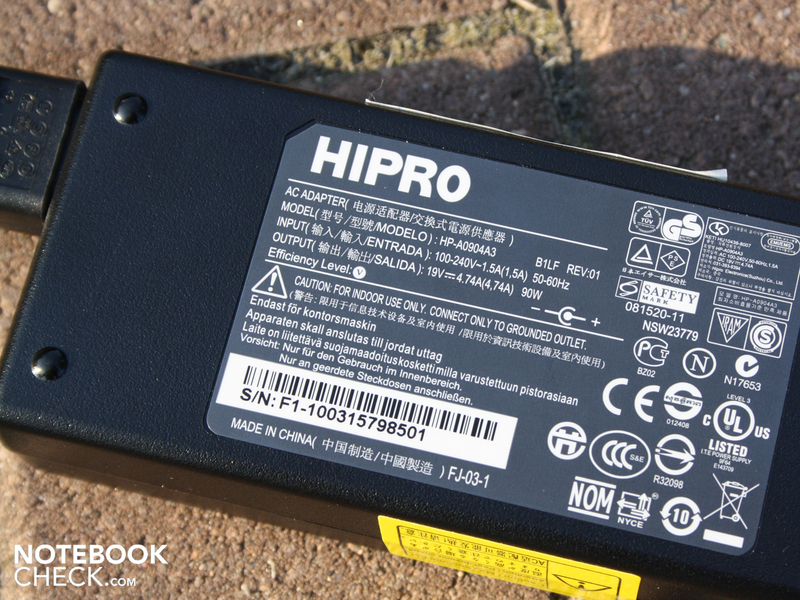 This is the same battery (AS10D31) as in the identical (base unit) Aspire 5741G. The Core i3-system put even lower numbers with a run time of 2:19 when surfing via WLAN. Testing the run time of a DVD-film yielded only 134 minutes (2:14 hours), which is enough for a feature-length title. For successive viewings, the Li-Ion battery is charged and at the ready after 1:27 hours. Those not stressing the system much at all can expect the notebook to last up to 4:46 hours (idle), as calculated with the BatteryEater Reader-Test. These 286 minutes are practically useless when talking about daily operation, as it can hardly be expected that the notebook will be operated without any stress, with lowest display luminance and with WLAN off. The newest Intel processors all have something in common: when at idle they require less energy than their Core 2 Duo predecessors. Powerful dedicated graphics solutions aside, all previous i3/i5 test models could lay claim to an electrical consumption of between 8 Watts (13-inch) to 15 Watts (17-inch). 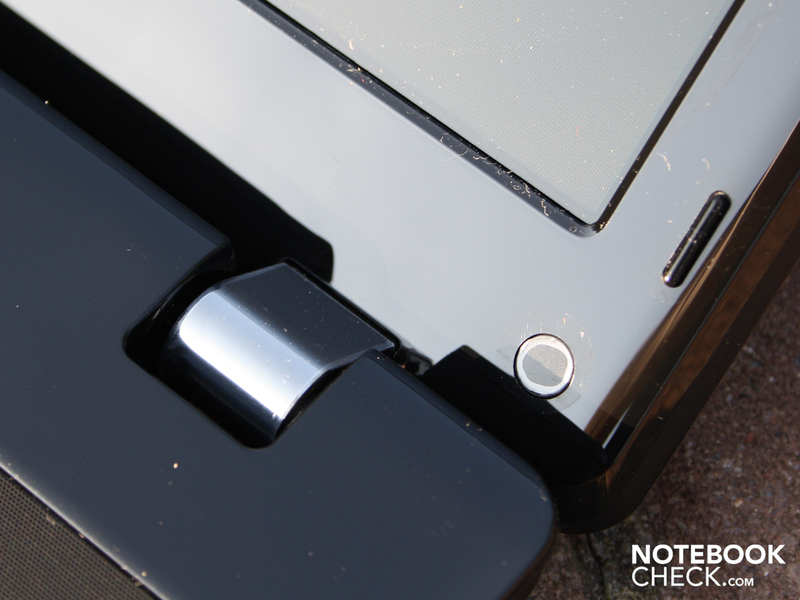 The Easynote TM sits right at the low end of this spectrum with an idle-consumption of just 9.4 Watts. Realistically during Office applications and brief periods of stress the CPU will be using somewhere around 20 Watts. 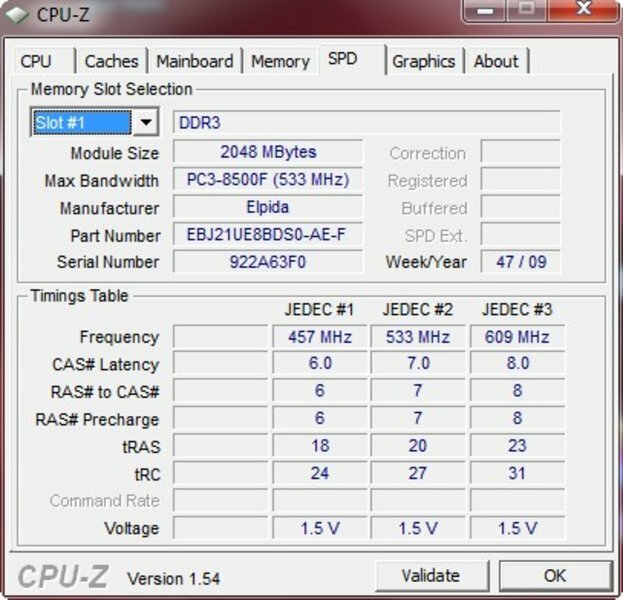 When the HD5470 is busy with a 3DMark2006 the consumption rises to 52 Watts. The maximum current consumption during a Prime95 and Furmark stress test lies 20 Watts more than this value at 70.5 Watts. The 90 Watt AC adapter is thereby properly dimensioned. 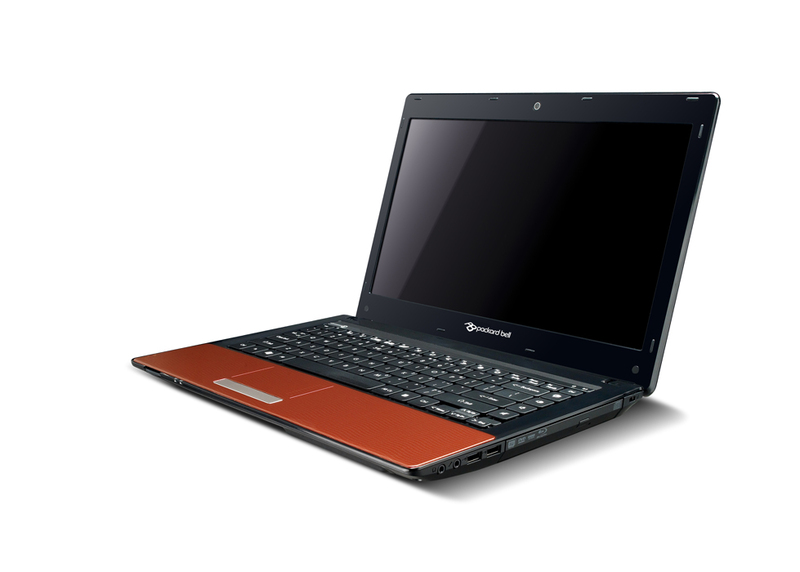 The Packard Bell Easynote TM-JO-075GE with a Core i5-430M (2.26 GHz) is a 15.6-inch all rounder with relatively high performance. 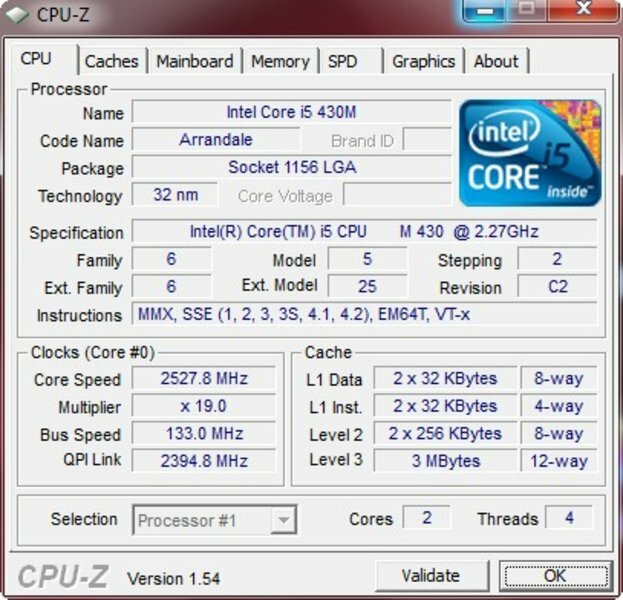 Multi-core applications benefit from Turbo-Boost (automatic overclocking) and hyper-threading. The on board equipment is a bit lacking: eSATA, USB 3.0 and ExpressCard are all missing. 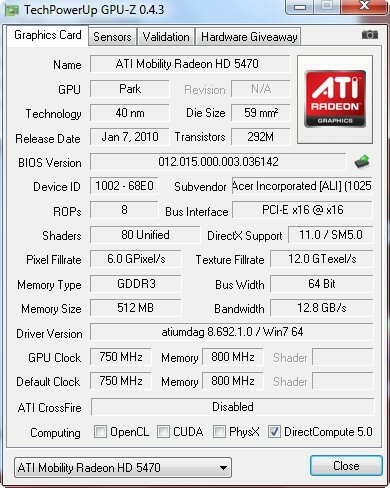 The entry-level graphics card ATI Mobility Radeon HD5470 can only play current games in greatly reduced resolution and detail. Gaming fans should look to the HD 5650, HD5165 (rarer) or the Nvidia GT330M as a minimum. The battery life is modest but acceptable for most users, and all thing considered, the run time available from the weak 4400 mAh battery is actually quite good. We were able to achieve almost three hours when surfing with WLAN. The contrast-weak, glossy-type AUO display is not worth is salt in this application: such a display just meets the standard for cheap Office and multimedia laptops. 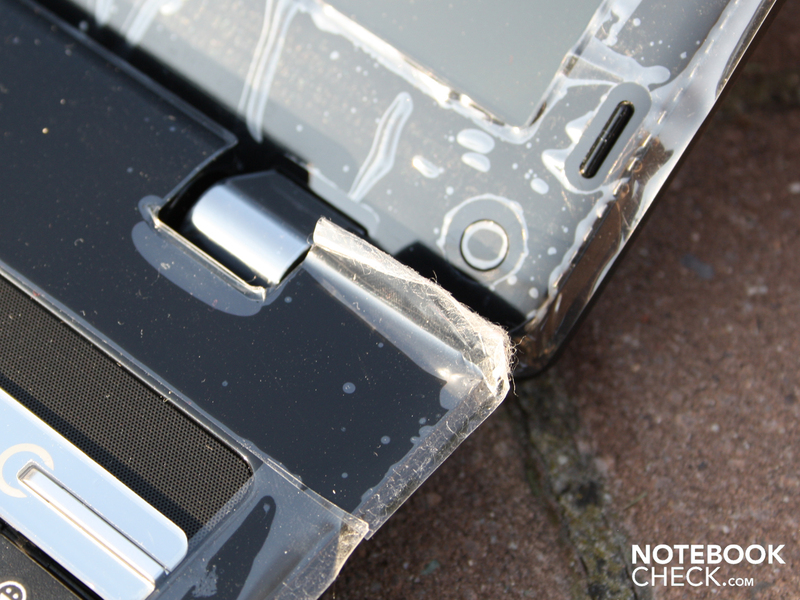 The Easynote TM can check off a firm, stable case and premium (though sensitive) surfaces as advantages. Also the notebook is very quiet. The keyboard with numeric keypad was well executed with respect to the layout and the pressure point of each key is crisp. Unfortunately, the spongy feedback of the keyboard stands in the way of greatness. 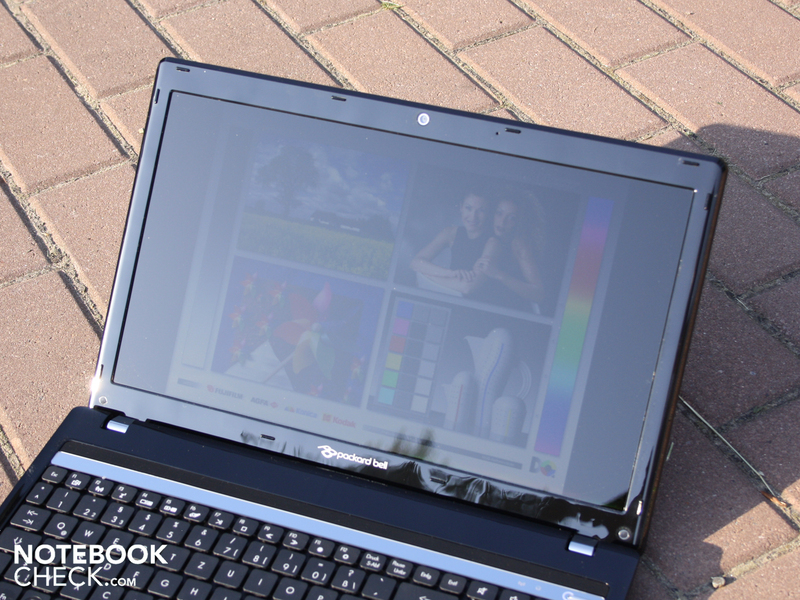 For consumers not looking for gaming performance or outdoor use, the Packard Bell Easynote TM87-JO-075GE is worth a look. 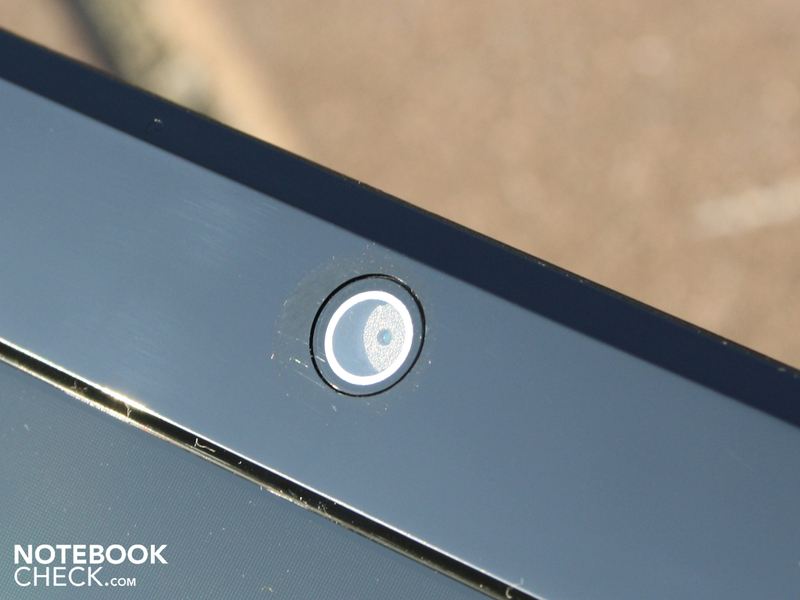 The surfaces and flashy optics look impressive and the device smacks of quality (if not in the more important details). 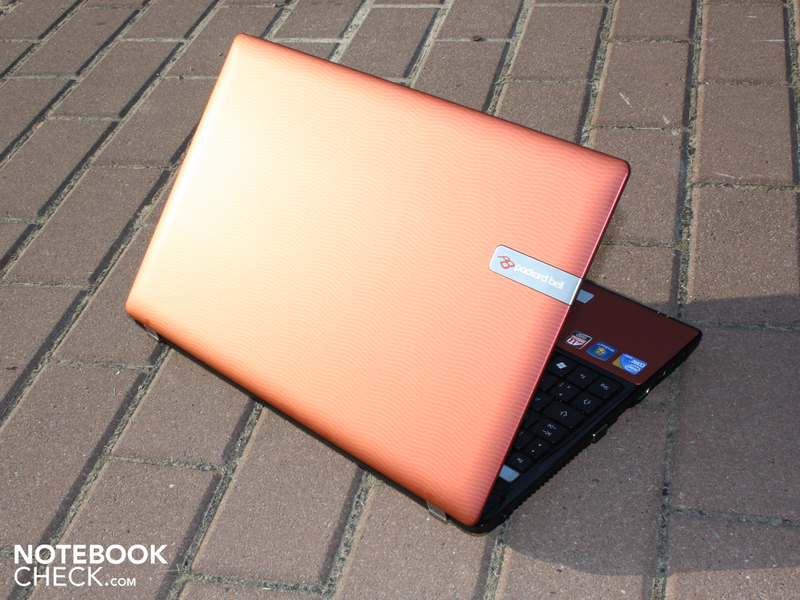 The 15.6-inch notebook is available starting at 690 Euro. Those counting their pennies or users unconcerned (or unconvinced) by the fancy optics can get more punch for their dollar. 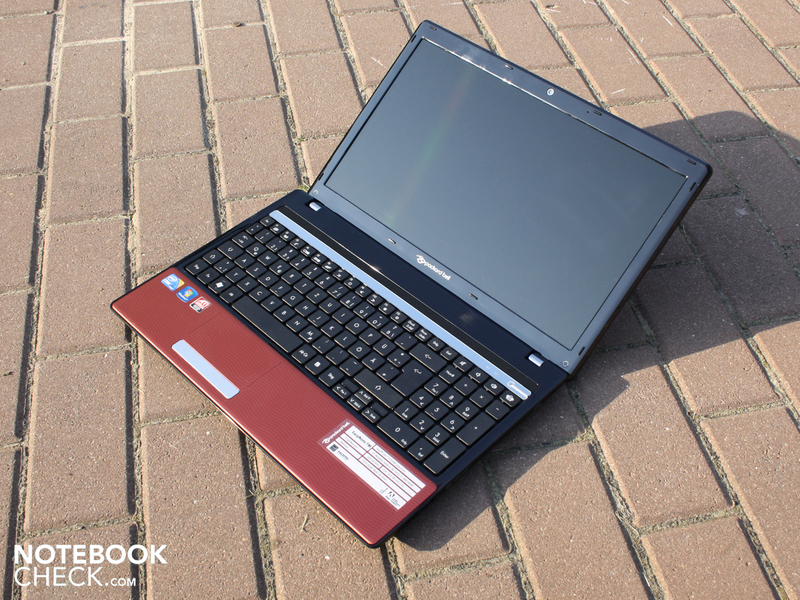 The Aspire 5741G-434G50Mn is available with an i5-430M, GeForce GT320M, Bluetooth and a 500 GB hard drive for 690 Euro. 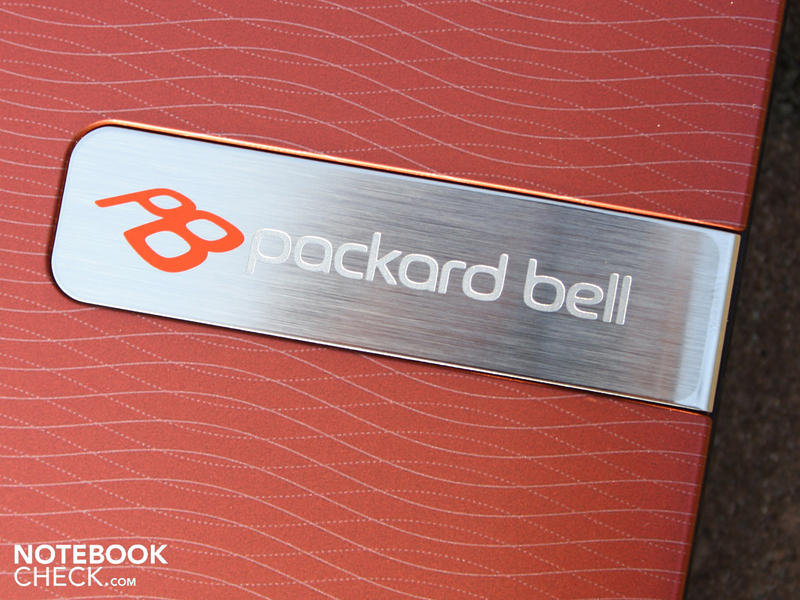 Acer's sister Packard Bell is once again working off of a platform strategy. is extremely friendly to fingerprints. To keep up appearances, the cleaning cloth must be utilized daily. 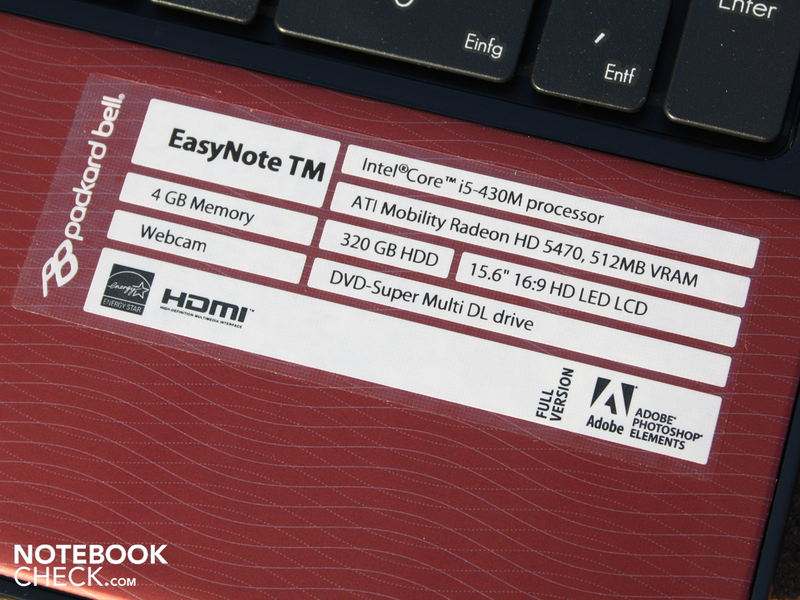 Technically, the Easynote TM has a fast Core i5-430M processor and an ATI HD 5470 graphics card. After this side view, the number of available connections has been reached (Right 2x USB). Surfing on the beach? The glare type TFT is hardly ideal. 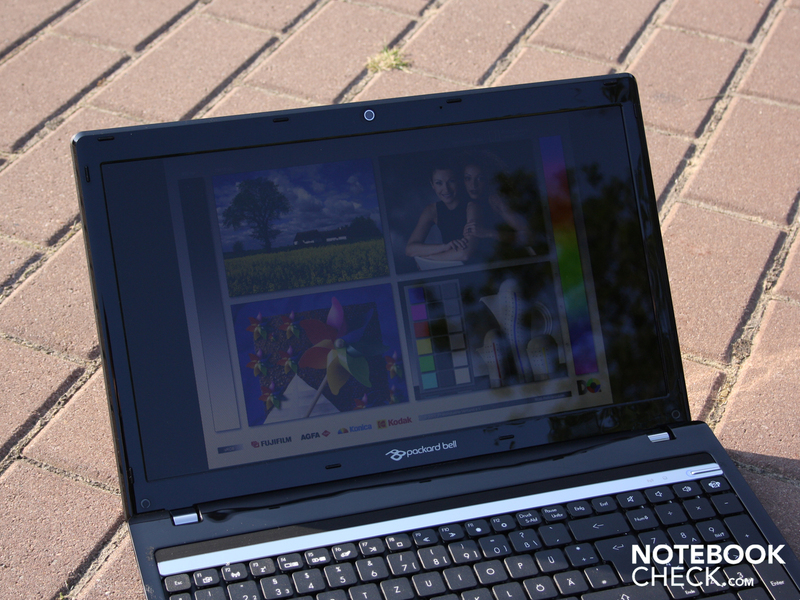 With battery life of three hours the notebook is quite usable. There is enough juice to play a DVD movie for a good two hours. It certainly isn't much, but it is more than passable for the 4400 mAh battery. 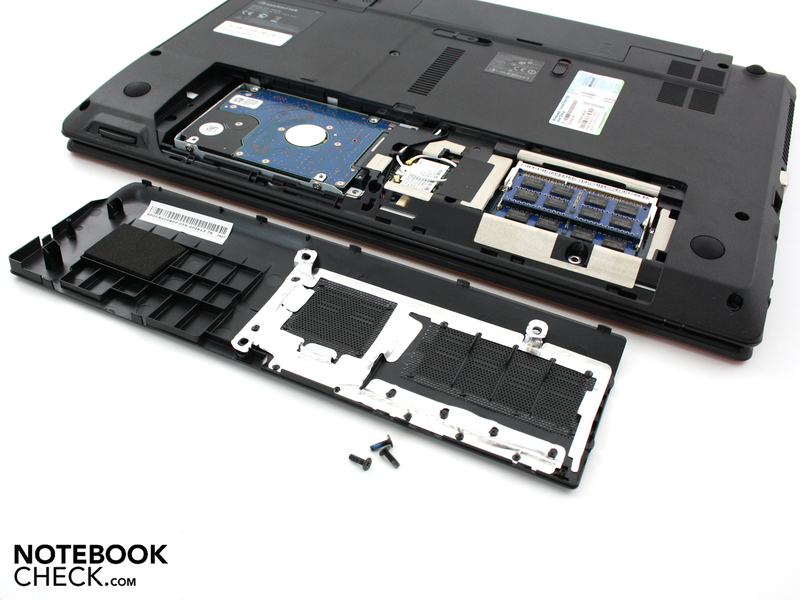 The underside reveals access to the components. and the hard drive, WLAN-module and RAM are accessible. 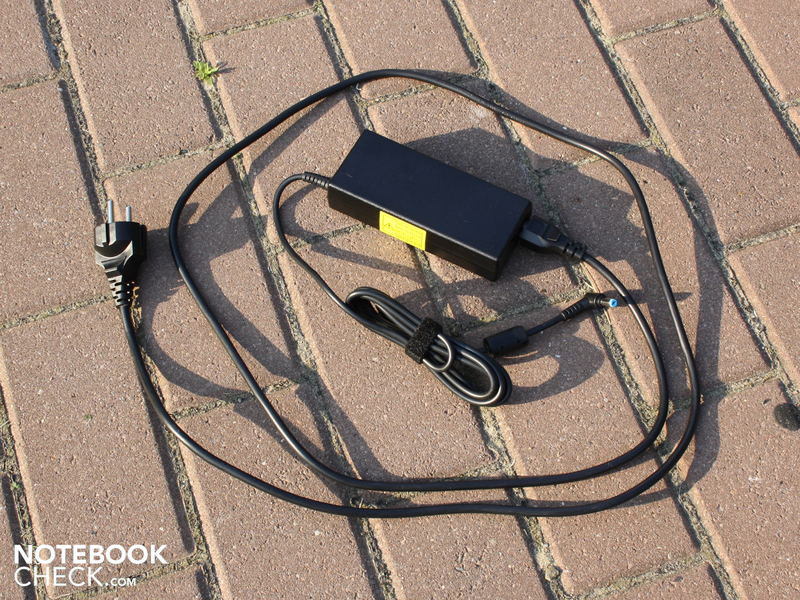 The AC adapter comes with a 1.2 meter-long cable. The 90 Watt adapter is capacity enough to handle the 70.5 Watt max. usage. 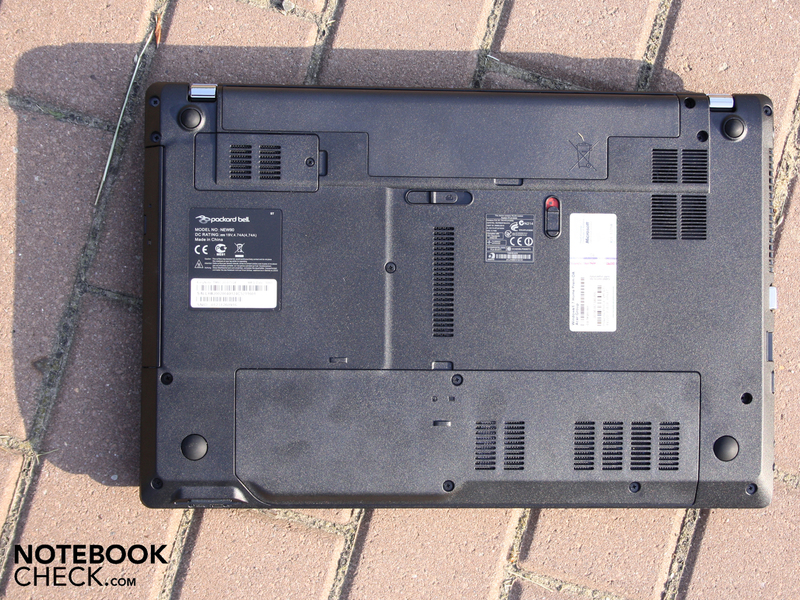 lies the chassis of the Aspire 5741. This is not a bad thing, as the construction is stable. The hinges keep the lid secure and taut. The exterior looks very high-end to the eye. Begin with the red plastic outer lid. 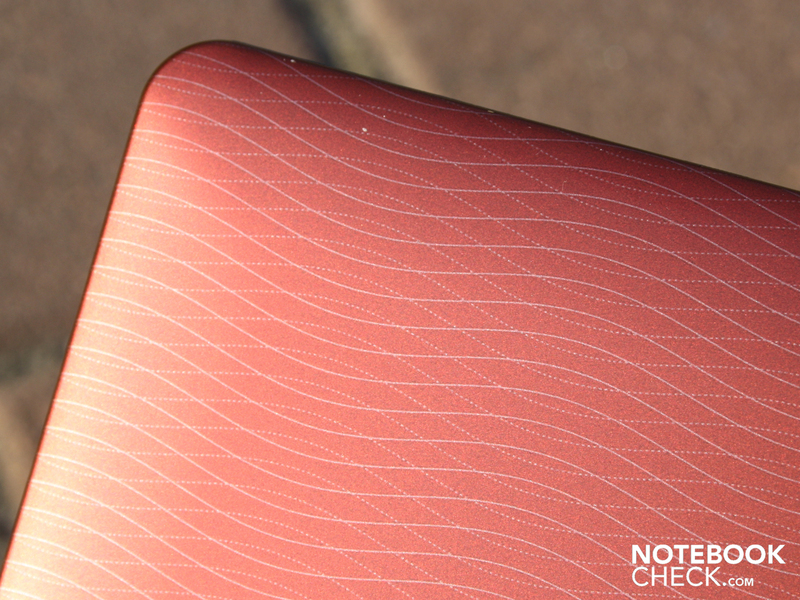 Which possesses a finely patterned matte finish. The 15.6-incher comes dolled up and decked out. 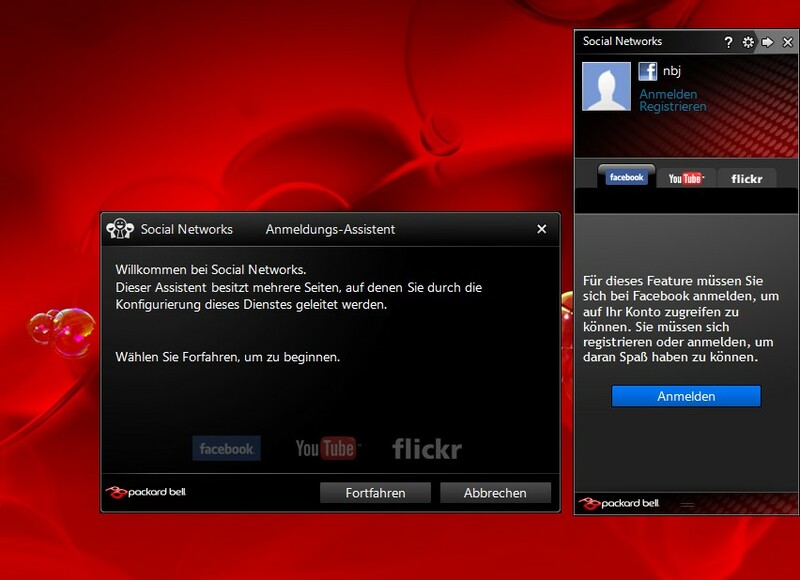 This banner informs the user of the Social-Network button. Whats with all the plastic? as is the reflective strip above the keys. 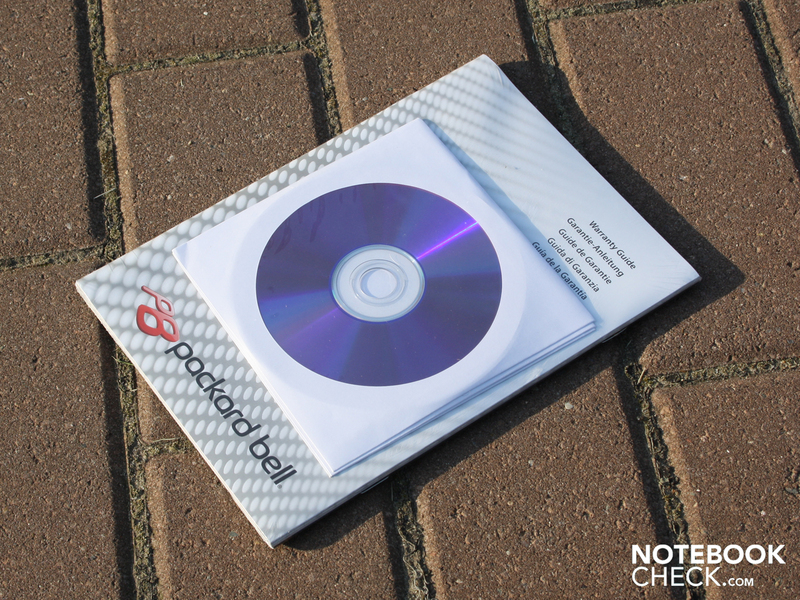 Blank optical media is included to create a Recovery-DVD. A sturdy work surface finished in a steel-look as well as quiet operation that was never a distraction. 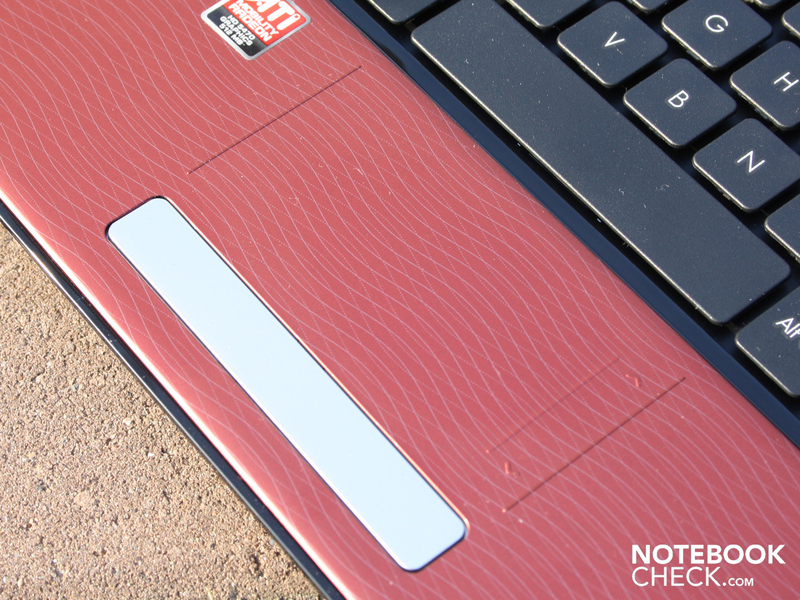 With an ATI HD5650 the Packard Bell Easynote TM87 would have been the cream of the crop. 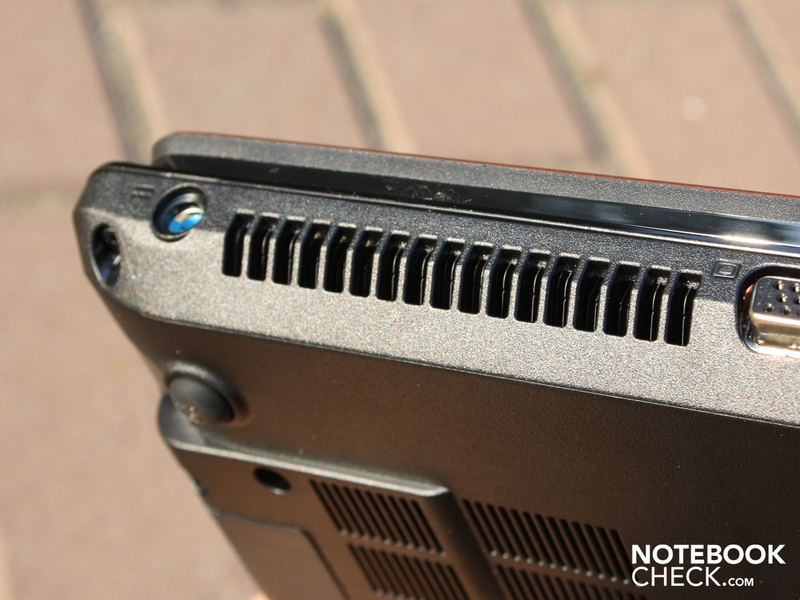 How two notebooks with the same base, the Easynote TM87 and the Aspire 5741, can end up looking completely optically dissimilar. Toshiba Satellite L550-207: For 660 Euro there is a 17.3-incher that packs more graphics horsepower. 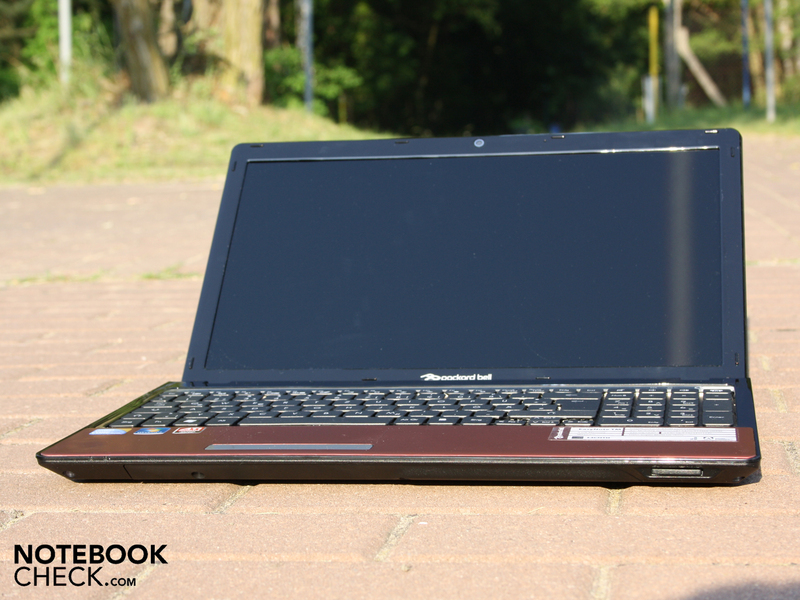 Packard Bell Easynote TJ75: starting at 660 Euro a 500 GB hard drive and a totally different look. Samsung R525 Eikee: despite a performance-crippled AMD-CPU, it is very quiet and features an excellent keyboard (530 Euro). Sony Vaio VPC-EB1S1E/BJ: 100 Euro more expensive but with an HD5650. Acer Aspire 5740DG: from 740 Euro with an i5-430M, stronger HD5650 und 3D-Display!